Seriya «Nauki o Zemle» (Series «Earth Sciences») of the journal «Izvestiya Irkutskogo gosudarstvennogo universiteta» («The Bulletin of Irkutsk State University») publishes papers of Russian and foreign authors, containing new results in the field of natural processes occurring in different geospheres: lithosphere, hydrosphere, atmosphere, near-Earth space, as well as in the investigation of population, economic activities and their optimization, natural and environmental risks and disasters. Our special concern are research carried out at Baikal Lake and Baikal Nature Territory. The journal also publishes review articles on this issue. Series «Earth Sciences» are published quarterly on the journal website and the Scientific Electronic Library eLIBRARY.RU, the full texts of all articles are in open access. All articles received by the editorial board are reviewed. Series was founded in 2008. Certificate of registration PI № FS77-60784 on February 11, 2015 was issued by the Federal Service for Supervision of Communications, Information Technology, and Mass Media (Roskomnadzor). 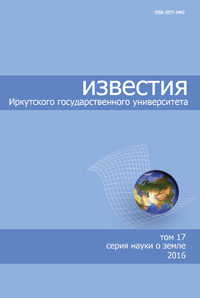 By the decision of the Higher Attestation Commission of the Ministry of Education and Science of the Russian Federation the series «Earth Sciences» is included in the List of Russian peer-reviewed journals where major research results of dissertations for the degrees of doctor and candidate of sciences should be published. The journal is included in the database of the leading Russian scientific journals Russian Science Citation Index (RSCI) on the Web of Science platform. The periodical is included in Research Reports and Database of All-Russian Institute of Scientific and Engineering Information (VINITI).